Captain Hugh and I spent Monday night with friends. They dropped us off at the airport on Tuesday morning so that we could pick up a rental car. We had a couple errands to run and decided it would be cheaper to rent a car for a day than hire a taxi for errands and to take four of us to the airport on Wednesday morning. Late Tuesday morning Captain Jordan, relief captain, came to get familiarized with Appledore V. Hugh discussed with him captainly things — rigging quirks, driving peculiarities, plumbing idiosyncracies and all things related to the upcoming Coast Guard inspection. The cry “All hands on deck” was given and we cast off the dock lines for one more sail. Captain Jordan was at the helm this time. We motored out to the Fort Myers bay and raised sail. There wasn’t much wind, but Hugh wanted to go through things with Captain Jordan so he wouldn’t feel completely at a loss when he had to go out with the new crew, which would be arriving in the next few weeks. While out in the bay, away from as many boaters as possible, we did a man overboard drill. We had been assigned our stations and had a fairly good idea of what we were to do. An old life vest was our victim. Very efficiently and smoothly the victim was sighted, navigated to (with sail raised) and successfully brought back on board to a round of “Well done!” “Good job!” Fortunately the victim was still fully functioning and artificial resuscitation was not necessary. Captain Jordan then gave orders to strike sail and we motored back to the marina. The two captains discussed more about how she handled and docking and tides. Hugh seemed confident that Captain Jordan would do fine as he lived in the area, knew the waters and had previous experience sailing tall ships. It was time to finish packing and then find some dinner. Bill went for a long walk, exploring the area and said that he’d have dinner on his own. Andy, Terry, Hugh and I took the rental car and drove south along the beach drive looking for a beachside meal. Hugh’s food radar directed us to at the Beached Whale where we ate on the rooftop porch and had a tasty meal. The next morning, Wednesday, we’d be leaving bright and early for the airport. Mike and Rex had already departed. Bill would be catching a bus later in the day to go visit his daughter in North Carolina. Andy, Terry, Hugh and I were flying out at about the same time so we crammed all our bags into the rental car and drove to the airport. We said a quick good-bye at the curb and went our separate directions. Andy was flying home to Indiana. Hugh and I were flying home to Michigan. Terry was flying home to Michigan and hoping to go down to North Carolina to work on his own boat. Bill was on his way to spend Thanksgiving with his daughter in North Carolina and then she’d drive him home to Michigan. Mike was on his way to the eastern side of Florida to talk to someone about driving a water taxi, but he wound up going home. Rex was going to spend a little time in Florida with his cousin, Rex, then meet up with a work buddy at a job site and be home for the holidays. Hugh and I would see Andy and Rex at some point sooner rather than later, as they are close friends of ours. As for Bill, Mike and Terry we weren’t quite sure when or where our paths would cross. But when our paths do meet again we’ll have a warm hug and a good firm handshake for them. And there might even be a plate of No-Bake cookies available. Monday was an easy day. Our last meal on the boat had been lunch on Sunday and the Captain wanted a “real” breakfast, greasy spoon diner. I asked around and was told that the must place to have grub was Marti’s Family Dining. I called Eroll’s Taxi the night before and specified that we needed a minivan for the five of us. “Where are you going?” the dispatcher asked. “You can’t go wrong at Marti’s.” He replied. After a hearty and inexpensive breakfast we walked a mile to the trolley stop and for fifty cents, twenty-five cents for seniors, we took the trolley back to the marina. It was nice to stretch our legs and feel land under us again. Laundry was done while cleaning up the boat and organizing gear. Captian Hugh was putting things in order for the temporary captain, Jordan, to take over for a couple of months. In particular was going through the Coast Guard inspection check list. Hugh’s been through inspections before and knows the only good ones are the ones when things are in their place. Through out the day he’d ask one of us, “Do you know where this is?” or “Have you seen… ?” He made sure everything was in order and made a list of things that needed to be attended to; hopefully Captain Jordan would get through the inspection smoothly. Andy wandered around with his camera taking pictures of lots of birds – an assortment of herons and egrets, ibis, stork and other water birds. Bill decided to go exploring too and wandered off. That night Drummond Island friends of ours, who spend the winters in Florida, came to see the boat and take us home with them for the night. It was nice to see Luanne and Mel. We even got to spend the night in a bed, together, that was larger than a cot. It was quite a luxury, as was the clean bathroom. “Bill I think you have a fish!” Terry watched the line move slowly with some strain. Bill was helping to prepare to set sail. “Bill, I think you should check your line,” Terry insisted. Bill poo-pooed him and kept working; he probably wanted to get to Salty Sam’s Marina in Fort Myers as much as the rest of us did. It had been a long trip. I started to pull the line in for him. Yes there was something on the other end. Yay! Bill finally got his fish. While we breakfasted he put his carpet-thread fishing line overboard with a shrimp on it. 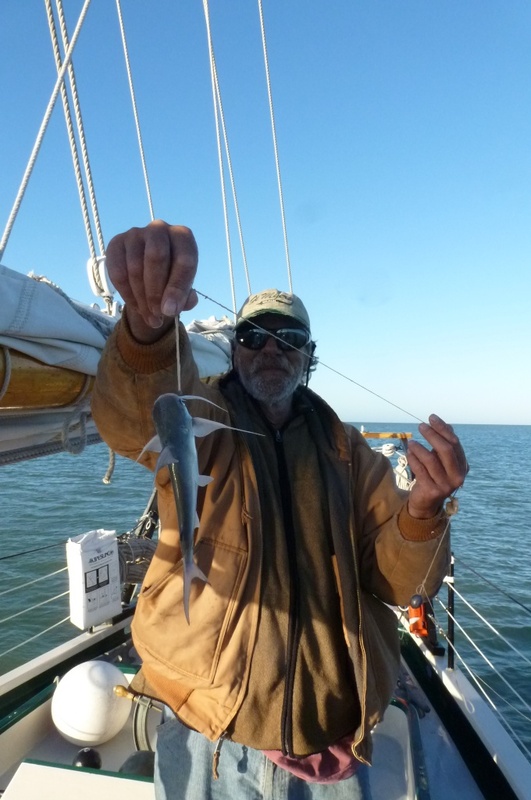 A gaff topsail catfish didn’t care that the shrimp was almost a week old, a week dead. It appealed enough for the little guy to take the bait. Then we made Bill pose for pictures. "Look what I caught! Finally!" We scrambled for our cameras to document the monumental event while the captain gave orders to turn the motor on and pull up the anchor. With cameras tucked away we motored off anchor and hoisted sails – main, fore and staysail. It was a beautiful morning for a easy sail. A bow watch was posted as the challenge of the day was dodging crab pots. Strings of green, yellow, orange, white and red, blue and white crab pots were in our path for miles. Fortunately the crab pots were willing to be pushed away from the hull by the small bow wake we created. Appledore V has a full keel and the prop is nestled in a cut-out of the keep, which can help prevent things, like crab pot lines, from getting tangled in the prop. The sun reflected off the water ahead of us, making it tricky to see some of the crab pots. Andy and I were the primary bow watchers that morning. We found it easiest to spot floats by sighting the line to the far side of us. Knowing the color and general angle that the pots were lined up on, we then visually followed the line until we could see where they were in front of us. This allowed us to visually intersect the pots before the boat did. “How far do they let people put crab pots?” I asked Hugh. That meant bow watch was going to be going on all day. All these crab pots gave me an idea – I decided I would have crab for dinner. Off of Captiva Island, a little yellow airplane flew by. Once it passed it turned around and circled back to get another look at us. That morning we dressed as we had almost every other morning we were on the water – layered and layered. As the sun came out these layers were starting to be peeled off. The heavy jackets came of quite quickly. Then the sweat shirts to leave most of the guys in short sleeved t-shirts. Captain Hugh had been wearing flannel lined jeans, as was I. It didn’t take long for him to change into regular jeans. I tend to chill easily so I kept my flannel lined jeans on along with a long sleeved denim shirt. The popularity of western Florida was quite evident by all the condos and apartments along the shore. The closer we got to Fort Myers, the more populated it got. Terry enjoyed pulling out the waterproof chart and following along locating where we were. I’d miss cooking for the guys and yet not having to be the first up to start breakfast was going to be nice. Having someone around to chat with or admire a green heron had been nice, and I was looking forward to not having someone always in view and to having my own room to get dressed in private, rather than having to ask Hugh to block the door to his cabin when I wanted to get changed. It would be different not being on board. All in all, it was like a grand vacation was coming to an end. It had been a grand adventure with lots of new experiences and fun memories to reminisce about in the future. I’m sure the others felt similar, although I never quite got a chance to discuss it with them. The day on the water had had a leisurely feel to it. Being at the helm felt more like play than work. With the sun shining everyone had spent most of their time on deck rather than being below chatting or reading. Standing on the dock as a six foot plus giant. It was Richard, one of Rex’s 600 cousin. Okay, well maybe Rex didn’t have quite that many but he does admit to knowing that he has several hundred cousins. Richard was a swell guy and rode his motorcycle from Ocala, FL to come see Rex and the boat. Shortly after our arrival a friend of Terry’s, who lives in the general area, came by to say hi. John Hawkins had heard earlier in the morning where we were and decided fly over us in his Grumman Lynx ‘78. So it wasn’t a student pilot, but Terry’s friend, John, who was taking pictures. After these hellos, I found a private corner to quickly change out of my too-hot and heavy flannel lined jeans and put on some light weight capri pants and a t-shirt. Ahh, that was much better. I then got sandwich fixings set out and got the hungry crew fed. It was a good thing I had been plying them with peanut butter celery sticks and no-bake cookies all morning, otherwise they would have been ravenous beasts. It was time to shift into marina life. We were hooked back up to shore power and had plenty of fresh water again. The shore head available with a real shower. And cheap laundry! Showers and laundries were on the top of everyone’s list of must do. I also had “get ice” on my list, for the beverage cooler. We were still living aboard and would not be leaving until Wednesday morning. It was the first time in five weeks that I did not have to worry about finding groceries. The icebox was slowly but surely being depleted of perishables and the seat lockers where the dry goods were still had plenty of food for us if we decided to eat on board. But no one wanted to, so Sunday’s lunch was the last meal. Richard absconded Rex and Terry went off to dinner with John, but the rest of us enjoyed a fun evening at Parrot’s Cay Caribbean Grill at the marina. A girlfriend of mine lived near by and joined us as well. We had not seen each other in about ten years, so it was fun to reconnect with Sharon. And raise a toast to our successful journey – we had arrived safe and sound. I am happy to say that I’ve been able to get the rest of the photos posted; from Day 25 through Day 34. There’s five weeks in total of photos. Also there are three pages of photos by Andy Roller. Make sure you check them out. They’re fantastic! He’s got some pictures of stuff that I never even saw. Under the Photos tab is a page of general Appledore V photos. They show the below decks. Also there are before and after photos of the crew on this page. You can see what 5 weeks on a schooner does to a person. I’ve also updated the Crew page, with a picture and brief bio on Rex, who joined us in Mobile. The Animals and Birds pages have also been updated, so check out the complete list of creatures we spotted along our journey. And the Route page has been updated with our final stopping places. As a reward for reading to the bottom of the Route Page, or skipping to the bottom, you’ll read how many miles we actually covered. Thanks go to Terry, our data guy, for keeping track and figuring it out! And bear with me as I squeeze time to finish writing the events of the last three days – Days 32 – 34. You’ll get those updates automatically. I want to thank you again for reading along and writing in as we went on this great journey. You’ve just gotten a bunch of posts updating you on our journey of getting into Mobile, AL and Turner’s Marina to into the Gulf of Mexico. We arrived safe and sound in Fort Myers, FL on Sunday afternoon. I’ll get photos up as soon as I can. Some of the crew has already departed us – Mike and Rex. The rest of us leave on Wednesday morning. Last night we sailed through the night. Terry and I had the early morning watch from three to eight and got to see the sunrise. It was a beautiful day – nice clear blue sky, good winds of 10 to 15 knots. We had the “day off” and came back on watch at 6 PM. Our “go to” spot on the GPS plotter was for Tampa Bay, at a bearing of 135. From there we headed south along the western coast of Florida. The water was smoother than it had been in previous days; heeled way over Appledore V sliced through the water, making upwards of 7. 5 knots. Occasionally we’d be wrapped in warm wind coming off shore. There were no other boats in sight, which made it easier to enjoy the beautiful night, we didn’t have to be concerned about traffic and we were far enough out we didn’t have to worry about buoys. Before the full moon rose too high Terry and I tried to spot the constellations we knew: Orion, The Big Dipper, Casseopia, Taurus and the Pleiades were the easiest to spot. We also found the twins, Gemini. Late into our watch the wind started shifting more south and tried started to cause some weather helm, bringing us into the wind. At one point we heeled over more than normal and at the same time an alarm went off. “Captain, we’ve got an alarm going off.” I hated to wake him, but it’s part of the job. Fortunately there was nothing to worry about – just water getting sloshed to one side enough to set the bilge alarm off. He decided to stay up on deck with us as we were going to drop anchor near La Costa Island. We were about 20 miles north of the entrance of Fort Myers. Trying to navigate our way in the narrow channel in the wee hours of the morning was not something Hugh wanted to do. It would be easier to lay up for the rest of the night. “We’ll have anchor dropped and in bed by midnight,” Terry predicted. What an amazingly beautiful night. It will be a night I remember for a long time – crisp and warm sea air, full moon, millions and millions of stars, dolphins, shooting stars and ghost birds all while sailing under full sail. Amazing. We had good wind to raise the main, fore and staysails. Depending upon how much wind we had and the direction we did turn the motor on for some parts of the day. Since leaving Mobile we’d been headed east. A lot of us have sore necks from being heeled over to starboard and sitting in the same position looking forward. The wind had picked up causing waves that were tossing the boat in a corkscrew motion. It’s one thing to rock to and fro or to be bounding through the waves. When the water causes the boat to do both motions at once it creates a corkscrew motion. I didn’t know if it was because I was slightly constipated that I started feeling a bit nauseous or if it was the heat from the diesel stove in the galley as I was making shepherd’s pie for dinner. Whatever it was I wasn’t able to eat lunch. Poor Andy, who prefers to be up on deck anyway, started looking green gilled as if he was feeling like I was. Unfortunately it wasn’t too long after lunch that it came back up for him. It was a fun day. Rex and Terry pulled out the tackle that Captain Scott had gifted us with and put lines over to troll for fish. We also had about eight dolphins run with us for a half hour. About ten o’clock in the morning Rex thought he had a fish on his line. He’s been deep sea fishing before and had us all excited about the possibility of fresh fish. His line was over the stern and he reeled it in and in. His jig was empty when it came in sight; oh well. I guess I’ll need to make dinner as planned — spaghetti and salad. Around noon, I spotted a LBJ headed straight towards us, coming up from behind. It hovered around a starboard stern and then landed on the Lifesling 2, overboard rescue system. The little brown job birdie hopped around pecking at our lines, seeming to look for a snack. It seemed tame enough that I could have even petted it if I had wanted. We identified it as a yellow rumped warbler in winter attire. It stayed for a couple minutes and then just flew off. “Guess what Terry?” I asked. Time flew by; before he knew it an hour and a half had sailed by and it was time for him to get himself off the doghouse and stretch his legs. I would then take the next hour and a half then go prepare dinner. Andy didn’t eat but I decided to eat in the fresh air, which helped keep my stomach settled. “That’s great spaghetti Julie,” Mike said. “Thanks for another great meal,” Bill chimed in. After dinner at 18:00 hours, Terry and I came off watch and cleaned up. A crimson beauty rose for us that night. It was almost full. We then turned in for the night. We continued to sail through the night.